For your peace of mind Digital Works Professional Imaging is proud to announce a fast track, low cost solution for Loss or Damage to goods in transit. Claims for Loss or Damage are fast tracked to cause as little inconvenience to you and your client as possible. So what does the Service Options cover you for? Loss resupply to the value of the order dispatched via our Freight options and upto the value of the selected cover. Damage resupply or repair to the value of the damaged goods dispatched via our Freight options upto the value of the selected cover. Should you choose a cover *less* than the value of the goods purchased, you will be required to pay the difference of the value of the order, or damaged goods, for the claim and resupply to proceed. What doesn't the Service Options cover you for? Should you or your representative pick-up directly from Digital Works. 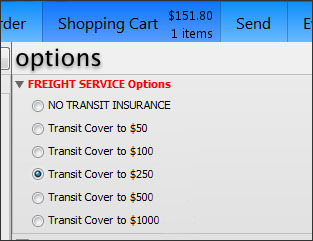 Should you arrange your own courier or freighting company. Should you arrange left for an unattended delivery. Contact Digital Works by email within 48 hours of receipt. Provide the original order number. A return authorisation, valid for (7) seven days from date of issue, will be issued. Our friendly Digital Works support crew will contact you by email with instructions on how to proceed with the fast track processing of your claim. In most cases damaged goods must be returned.